Tucked away down a quite lane on the pristine white sands of Natai Beach, stands the luxurious Villa Shanti. This enchanting beachfront retreat is one of three deluxe private villas available for rental in the exclusive Jivana Villas estate, just 25 minutes north of Phuket International Airport. The eye-catching Villa Shanti features five contemporary Thai-style pavilions, housing six elegant ensuite bedrooms, a spacious ‘Great Room’ for lounging and dining, family room and immense modern kitchen. The indoor and outdoor living spaces harmoniously balance comfort and simplicity with rich teakwood features, crisp white lines and lush gardens that reflect the rural landscape of the Phang Nga region. A courtyard with granite water feature and lily pond marks the entrance to Villa Shanti. To the right of the courtyard is a family room and to the left a fully equipped modern kitchen. Centred at the front of the courtyard is the open-plan ‘Great Room’, neighboured on either side by a bedroom pavilion. Beyond is the swimming pool, and the dining and relaxation salas, all bordered by an immense lawn. At Villa Shanti’s centre is the open-plan ‘Great Room’ with lounge seating and dining for twenty. The room has a high vaulted ceiling and is cooled by ceiling fan. Tall sliding glass doors on all sides glide back to create an airy space. Unique pieces of artwork accent the room, while warm lighting enhances the ambiance. Just a few steps away in a separate pavilion is the air-conditioned family room and office space with soft lounge seating. A large built-in teakwood entertainment centre houses a small library, 40-inch flat-screen TV with satellite channels, DVD player and sound system. Villa Shanti’s outdoor areas provide ample room to bask in the sun or dine under the stars. A spacious veranda spans the front of the king suites and ‘Great Room’, in front of which lays a 25-metre infinity pool with sun loungers. Beyond is an immense lawn strewn with coconut palms, and two individual salas for dining and relaxation. The mirror-image bedroom pavilions lie on either side of the ‘Great Room’. Each offers a master suite and two ensuite guest rooms with floor-to-ceiling sliding glass doors that open onto a shared veranda with panoramic views of the sea. Adjoining each master suite is a twin bedded ensuite room with garden view. All rooms have vaulted wooden ceilings with fans, air-conditioners, comfortable seating, writing desks, large wardrobes and private enclosed gardens. The generously sized master suites come with four-poster king-size beds and dressed in fresh white linens. Large wardrobes partition the sleeping areas from the ensuites. The marble and terrazzo bathrooms include his and hers sinks, rain showers, deep built-in soaking tubs and granite tubs set in private gardens. The two king bedded guest rooms are identical to the master suites but without granite tubs in their ensuite bathrooms. In their place are enclosed gardens set behind glass walls. Villa Shanti’s twin-bedded guest rooms are slightly smaller in size yet include many of the same features as the master and king-bedded rooms. These rooms have smaller wardrobes, and their ensuites are equipped with single sinks and outdoor showers. Sliding doors connect them to the master suites, convenient for those travelling with young children. 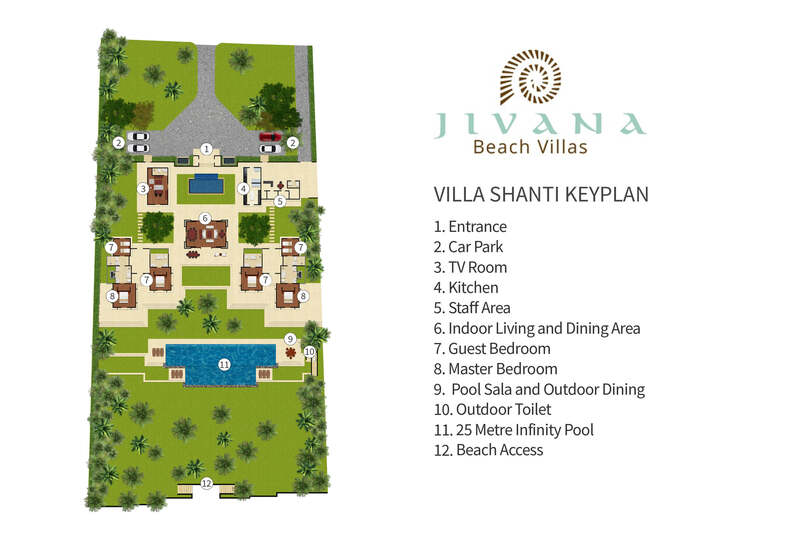 Jivana Villas, Natai Beach, Phang Nga, Phuket, Thailand. 12 guests (6 ensuite bedrooms: 4 with king beds and 2 with twin beds). Open-plan living with dining for 20; family room; relaxation sala; veranda lounge seating and beachfront sunset sala. 25-metre infinity pool with shallow section for children. Villa manager; private chef; housekeeping; security; groundskeeper. Concierge team and additional staff (babysitters, masseuses) available on request. Satellite TV; CD player/stereo system; DVD player; CD/DVD library and iPod docks with speakers; library; board games. Villa Shanti is exceptionally well equipped for families. Facilities include: baby cot, high chair, CDs/DVD’s, board games, toys, pool toys. In-villa treatments selected from a comprehensive spa menu can be carried out by professional therapists (extra cost applies). Villa Shanti makes an idyllic beachfront wedding and special event venue, catering for up to 150 guests.